U.N. Envoy to Libya Ghassan Salame, center, attends the second day of the international conference on Libya in Palermo, Italy, Nov. 13, 2018. 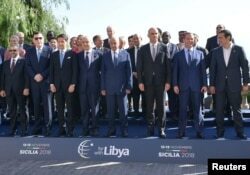 Italy's efforts to host a summit on stabilizing Libya after its seven-year-old conflict appeared to fall flat Tuesday, as organizers on the second and final day of the meeting in Sicily failed to even confirm whether representatives of the main factions were attending. One major player, General Khalifa Haftar, commander of the self-styled Libyan National Army that controls much of eastern Libya, arrived on the island late Monday, but it was unclear whether he would take part in the talks. Earlier media reports quoted him as saying the conference lacks a clear agenda. The conference in the Sicilian capital of Palermo began Monday with a private dinner hosted by Prime Minister Giuseppe Conte before the plenary sessions Tuesday. Rome wanted to keep the focus on the OPEC producer, where chaos has reigned for seven years among the hundreds of rival armed groups and tribes since Libyan leader Moammar Gadhafi was toppled and killed. But what was largely apparent at the meeting is the brewing rivalry with France over who will lead efforts to pacify Libya. France called a similar gathering earlier in May, angering Italian leaders. Italy had hoped U.S. President Donald Trump, Russian President Vladimir Putin and German Chancellor Angela Merkel would attend, but they and a number of other invited leaders sent lower-ranking representatives. France sent its foreign minister. Italian Deputy Prime Minister Luigi Di Maio said last week he was confident a plan for the stabilization of the North African country could be drawn up. ''We will not create false hopes, but it is very important for us to find a shared road with all those involved to move on to the next step,'' Di Maio said. Heads of delegations pose for a photo during the second day of the international conference on Libya in Palermo, Italy, Nov. 13, 2018. Italian officials made it no secret that part of their intent is to portray Italy as leading international efforts to bring peace to the North African country, which Rome ruled as a colony after Italian forces seized it from Ottoman rule in the years before the World War I. Much of their message was directed at Washington. Libya is currently run by two administrations: a weak U.N.-backed Government of National Accord, run by Fayez al-Sarraj in Tripoli, and another in the eastern part of the country, headed by Haftar. Al-Sarraj had hoped elections would be held in December, following discussions at a summit earlier this year in France, but this plan was abandoned due to ongoing violence and chaos in parts of Libya. Italy and France have strong business ties in Libya and their growing rivalry, analysts say, is hurting peace prospects. Prime Minister Giuseppe Conte has denied such a rivalry exists, saying Rome and Paris have a common interest in stabilizing the nation - an important source of oil and gas for Europe. Libya is also a departure point for African and other migrants who seek to escape war and poverty and head for Europe, often using Italy as a gateway.